Happy Easter!!! He is RISEN! What a glorious day to remember the sacrifice and victory of our precious Lord Jesus Christ. May you enjoy this day with your family and friends. LEGACY: We have a special treat for you this month. This video interview of the four Clarkson kids together shows them reflecting what it was like to grow up in their home. Did they appreciate the traditions and intention as much as Sally and Clay did? They share many favorite books and stories from their childhood home. You will be inspired in your mothering to keep pressing on as you watch and listen to their memories. INSPIRATIONS: We have so many delightful things to share with you this month. First of all, Sally and Clay have decided to share the first chapter of The Lifegiving Parent with you this month before it is released to the public! Enjoy it and please tell your friends about this new delightful book. We also want to draw your attention to the first lesson in the Visual Arts Series. Kristen is teaching us about Claude Monet, his life and art. Fascinating and inspiring, this talk would be a wonderful one to listen to with your children. You can look at some of the highlighted art works that Kristen discusses and then check out the fun books from the library. Enjoy learning something new alongside your children of all ages! In Living Books, Jaime Showmaker continues our series on authors with a great article on Louisa May Alcott. Little Women, anyone? If you haven't read it yet, it is one of life's great delights. Sally continues to share from Hebrews and inspires us to be women of action with Abigail. She was a wise woman who used her available resources to prevent David from making a major mistake. Brandee brings us a simple and classy recipe for crustless quiche. This is an easy recipe made from ingredients you likely already have on hand. Share for a very pretty Sunday brunch or a special breakfast for your kids before they head out for the day. MORE LIFE: Don't miss these short encouraging videos from two of Sally's Mom Heart ministry leaders. Jacqui Wakelam gives a bit of insight into ministering to mothers in the UK. Ginger Pattee shares her inspiring story of being called by God to reach out to mothers in prison so that they can connect and mother their children upon release. Wow! Forum: It's coming! Any day!!! We’re calling it the Life With Sally Forum, a place just for members to create lines of connection with other lifegiving women from all over the world and discuss what you’re learning on Life with Sally. Storytime: Keep an eye on Family Storytime in the Resources section. Clay will be trying his hand (and voice) at selected readings from books out of the Clarkson’s legacy of library of 500 or so antiquarian books from 1860-1920. Once he gets past the inertia of learning how to live in the UK this spring, this will become an ongoing project for Life with Sally. In the coming weeks, you’ll hear from Clay and Sally about their newest book with Tyndale, The Lifegiving Parent, which officially releases on May 1. We hope to have some special goodies here, exclusive for members to go with the new book. We’ll continue to learn from Holly, Jaime, and Terri about composers and authors, including James Herriot, Mendelssohn, and Williams. Sally will be sharing about “Giving Peace through Discipleship.” Kristen will continue her new series on visual art and artists which you can experience alongside your children. At the London conference- what an amazing time with beautiful and precious women! As you may have heard on Sally's recent podcasts, we just returned from a very special trip to visit Sally in London, celebrate her dear friend, Lynn's birthday, and help with the UK conference. Due to Sally's major eye injury and infection, the Lord clearly had us there to encourage and help her, with Dr. Gretchen translating the medical lingo and even being able to apply the hourly drops and care for Sally in that special way. In between doctor visits and eye drops, we were able to see so many special and inspiring sites. Here are just a few photos from our week. Magdalen College- CS Lewis territory. Miss Lynn's very special birthday tea. There's nothing like a new baby. 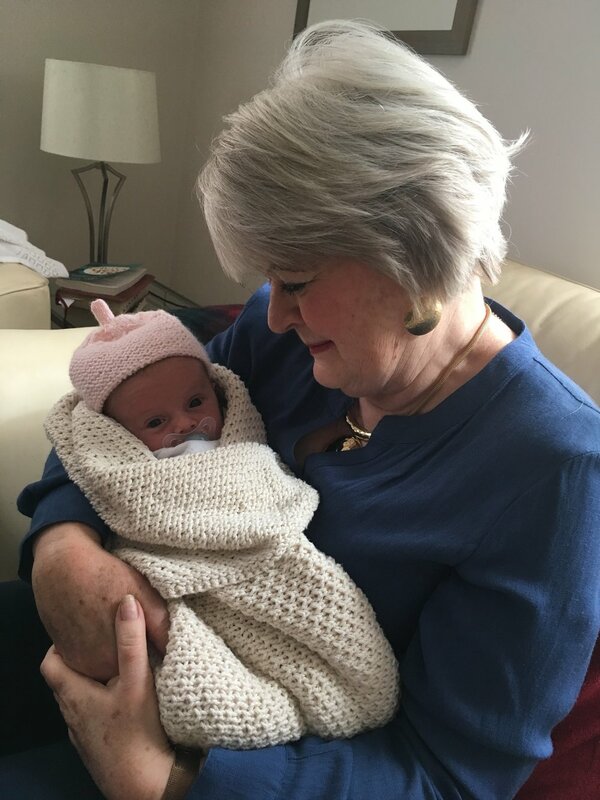 Sally's first grandchild, Lilian. At the Old Parsonage for birthday tea time. Joel and Sally on the train into London for the eye specialist appoiintment. CS Lewis' house, The Kilns with Jacqui and her dear children. Bodleian Library, Radcliffe Camera, Oxford. Eye drops. eye drops, always eye drops. Trafalgar Square - see the giant lions? Amazing. We love curating these posts and wonderful lessons from Sally and many of her nearest and dearest. We pray that the Lord uses Life with Sally to minister to you personally and give you encouragement to keep walking close to the Lord with your precious children.